Yes, we’ve made it to the fourth main outing of the inexplicably-populist post-apocalyptic open world RPG. Ever since Oblivion it seems that Bethesda have been incapable of doing anything wrong; each game they release experiences a couple of million more copies sold than the last one, and Fallout 4 doesn’t look like it’s in any danger of being an exception to that rule. That they salvaged the Fallout IP from the Interplay debacle and turned it into one of the most successful franchises in gaming is laudable; that their approach to Fallout 3 was to simply paste that IP over the top of Oblivion is less so. Don’t get me wrong, Fallout 3 achieved great success in splicing some of the core Fallout concepts together with the stock Bethesda open-world gameplay (guns, VATS), but this came at the cost of it being a noticeably shallower game than its predecessors in terms of actual RPG-ness. Even at the time I remember thinking that it was fine for a first outing, but that any follow-up should make better use of the setting and include such radical features as “an actual plot” instead of stunt-casting Liam Neeson and hoping nobody would notice it wasn’t there. This is why I’m a little dismayed at Fallout 4. I’m dismayed despite some of the good iterative improvements it makes to the mechanics, and despite Bethesda making the visuals a little less grey this time around, because in all other respects it is exactly the goddamn same as Fallout 3. Fallout 3 was Oblivion With Guns. Fallout 4 is Skyrim With Guns. If you have played literally any other Bethesda game from the last 15 years then you’ll know what to expect from Fallout 4. There’s a huge world map covered in a shitload of markers for you to discover. Roughly half of the markers are settlements and other points of interest, while the other half denote the location of mini-dungeons that you can blast through in 5-10 minutes. You get quests from the former to kill things in the latter. The quests and plot are about as deep as the virtual paper they’re written on. There’s a certain amount of joy to be found in the exploration, in seeing what’s over the next hill or around the next corner, but the switch from Skyrim’s snowy vistas to Fallout’s muddy, dirty wasteland means it’s operating at something of a disadvantage here. It is, in other words, a Bethesda Open World Game, with everything good and bad that that statement implies. I quite enjoyed Fallout 4. Yep, despite large portions of the Bethesda formula running very much counter to my particular tastes, I found there was actually a lot to like about Fallout 4. It’s by no means a comprehensive package of plus points, and the enjoyment that you derive will depend largely on your ability to use the character progression and crafting system to set your own goals, but as long as you’re willing to play the game on your terms rather than slavishly engaging with every mechanic it offers you for the sake of it then it is, in terms of mechanics, probably the best game Bethesda have released yet1. The biggest speedbump it encounters is right at the start of the game, in the pre-nuclear fire prologue that sets up your character; I found this tremendously dreary and not a good way to set the atmosphere or make me care about my supposed motivations for venturing out into the post-apocalyptic wasteland that is the setting of every Fallout game. Once the game has set you loose, though, and once you start to fully comprehend some of the possibilities the new mechanics make possible, then the chances are you’ll be hooked in for a good long while. A completely redone character levelling/perks system. A new crafting system for customising guns, armour and equipment. The ability to build settlements in the wasteland that slowly grow as they attract new settlers. The first two features are largely unambiguous successes. Talking about the new perk system first: the old Fallout system of percentage-based skills governing your chance of success at doing things in the game (pickpocketing someone, shooting a gun etc.) and perks that give you specific, passive bonuses has been condensed into a single sprawling system of perks. At the start of the game you get 30-odd points to invest in your character attributes (Strength, Perception and so on) which isn’t so different from the previous Fallout games, except that, interestingly, the “base” level of competence in a given area has been lowered from 5 to 1. This means that you start with one point in each attribute, and that you can’t really have a character with lower-than-average Intelligence (a favourite character archetype of Fallout) because it’s not possible to lower your attributes from their starting level. All you can do is boost them with those starting points; this is a weird way to start the game, and I must say it went against every natural fiber of my being to start a character with only one point in Luck and Charisma since my instincts were screaming at me that this was just crippling my character. It’s very unlike the previous games – or most RPG attribute systems in general – and the most confusing thing about it was that Fallout 4 asked me to make these decisions blind, without any real clue as to how these stats would affect my progression. It doesn’t show you the perk tree until you’re actually in the game and have run through the tutorial, at which point it’s a little too late to make changes without doing it all again. Once you see that perk tree everything becomes clear, however. It’s got one track for each of of your attributes, and each track is split out into ten tiers. Each tier of the track contains a single perk which will either confer some new ability or provide some kind of passive bonus. As you’d expect, the higher-tier perks (or lower-tier, since they’re set up starting from the top and progressing downwards) are broadly better than the ones at the start of the track, and this is where the attributes come in; they each have a passive effect on your chance to hit, melee damage, hit points etc., but they also determine which perks you can and can’t take. For example, you won’t be able to take a sixth-level Perception perk unless you have at least six points invested in Perception. Every time you level up you get a single point to invest in this perk tree, which you can either spend on a perk or on increasing one of your basic attributes to make new perks available. As a basic setup that works pretty well, especially so since a given attribute’s perks will at the very least enhance one another – and some of them go from so-so to truly and utterly broken once you unlock certain high-tier perks – meaning it pays to specialise. The thing I really like about this new perk system, though, is that nearly all of the perks in it are interesting and/or powerful. They have a significant effect on how the game plays. Every point spent in the tree feels worthwhile, and most perks can be levelled up multiple times to increase the bonus they give you. For example, even a basic “Increase rifle damage” perk increases it by a whopping 20% per point spent, and you can invest five points for a total of +100%, neatly doubling your damage output. That’s a powerful perk to take and a great decision to have to make, and the fact that most of the time it is a genuine decision between two or more potentially awesome choices should tell you a lot about how good this perk tree is. You can spend *hours* in here plotting your route through it depending on the character you’re trying to build – and for me personally, the nice thing about the perks is that they aren’t even remotely balanced. There’s about a zillion ways you can combine perks to make a ridiculously overpowered character, and that points to a surprising degree of awareness on the part of whoever designed this: they’ve realised that balance doesn’t matter in a single-player game just so long as the player is having fun making interesting decisions, and figuring out which of those zillion ways is the *best* way to break the game is fun. Then we come to the second success on the list: crafting. Crafting mechanics are all the rage these days so it’s no surprise they’ve made an appearance in Fallout, but what I did find pretty surprising was how seamlessly it was integrated into the game. Before I get into the nuts and bolts of the crafting, though, I should talk about the new equipment system: previously in Fallout you’d have a bolt-action rifle, a semi-auto rifle and an assault rifle, and these would all be separate weapons. 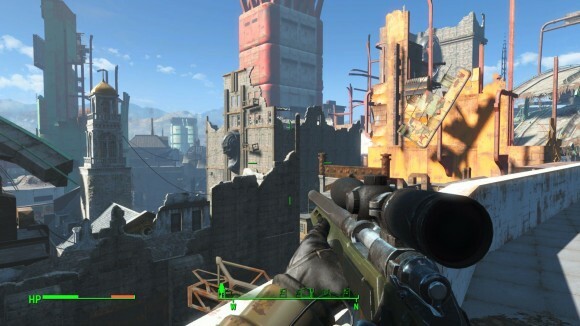 In Fallout 4, however, they are all the same weapon: you take the base of “rifle” and apply different modifications to it to make the weapon that best suits your playstyle. If you want an automatic weapon for fighting at short range you add a short stock (for hipfire accuracy), a set of reflex sights and an automatic receiver. If you want a long-range sniper rifle then you instead add a marksman stock, a long-range scope, a powerful receiver for boosting the damage of the round, and a long barrel for boosting the range of the round. By mixing and matching these modifications you can make pretty much whatever you want; the only real limitation is that each base type of gun will fire one specific type of ammo, and while some guns can be rechambered for a different calibre you’re always stuck looking for that ammo type if you become overreliant on one weapon in particular. This equipment system is very flexible. It does have a significant flaw in that the DPS of every weapon you make will be roughly the same (since automatic weapons do less damage per round), and since ammo is a finite resource that you have to scavenge you end up gravitating towards building weapons that maximise the damage inflicted per round. Nevertheless it’s another set of interesting decisions for the player to make, with one significant caveat: unless you can scavenge an existing weapon with the modification you want, you need to turn to the crafting interface to make modifications for your guns from scratch. This requires two things; first, you need points in the relevant perks (Gun Nut for guns, Armorer for armour, as well as Science for certain high-level power armour and energy weapon mods), and then you need raw materials to actually build the thing. The way you get said raw materials is actually really, really smart. You remember all those junk items from Fallout 3? The pre-war money, Abraxo cleaner and the like, which had no in-game purpose other than to clog up your inventory? 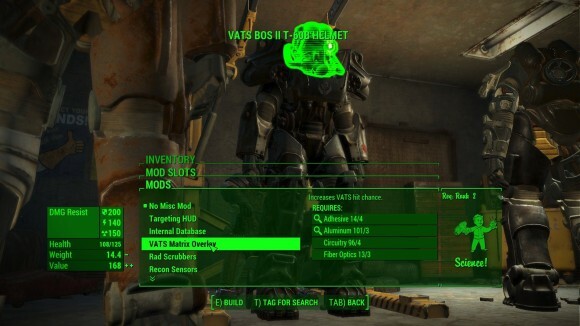 (Sidenote: the inventory interface in Fallout 4 is still utterly dire, as with every other Bethesda game.) That’s all changed now. Junk items can now be broken down into raw materials for crafting, which catapults them from “pointless time-waster” to “most important items in the game”. Much of the latter half of my game was characterised by a never-ending search for items containing Adhesive and Aluminium, which are used in vast quantities for high-level gun and power armour mods. This search meant I had to go into unexplored areas with the sole purpose of finding untapped sources of these materials to scavenge. 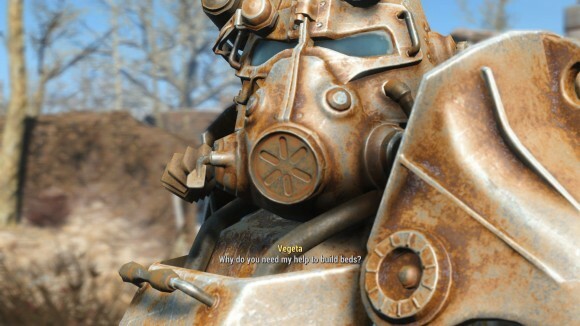 Not because I was exploring, or because I’d got a quest to go there, mind; literally the only reason was because I was 5 adhesive off of being able to complete the Calibrated Shocks for my power armour legs (or whatever). This not only gives those junk items a point, it’s also an incredibly natural thing to be doing in a post-apocalyptic wasteland. You quickly learn to identify what is and isn’t important, and if you’re having difficulty there’s an incredibly useful perk that highlights items containing raw materials you’ve tagged in your HUD. It helps a lot here that – again – the higher level weapon and power armour mods are really, really useful. Silencers and sniper mods are as overpowered as you’d expect, and are mostly locked behind level 4 of the Gun Nut perk; meanwhile a high Armourer skill lets you install a targeting system in your power armour helmet that highlights all “living” entities (this includes robots for some reason) in red, which is insanely good for night-fighting. Investing time in getting these mods onto your equipment feels like a good thing to be doing with a satisfying outcome. Unfortunately I really can’t say the same for the settlement construction mechanic; this kind of ties into the crafting mechanic in that it revolves around using raw materials to construct buildings instead of weapons, and the idea is to provide food, water and beds so that people will come along and settle in your wonderful new town. This is a nice idea, but in execution it’s sorely lacking. My big problem with it is that the settlements don’t do anything. They just sit there, occasionally being attacked by raiders (which obliges you to drop what you’re doing to go defend the place that’s under attack) but otherwise having zero impact on your game or on the wasteland in general. 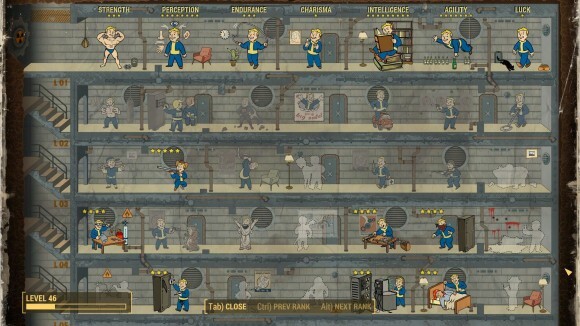 Because this is a Bethesda game the settlements themselves are fairly puny – you won’t get a population of more than 10 without taking certain perks in the Charisma track – and have the same broken-down, ramshackle look as the rest of the world despite you having literally just built the buildings out of raw resources. As a consequence the settlements are one area of the game that don’t feel satisfying to engage with at all. The truly baffling thing about them is that there’s a fair bit of effort that’s gone into the building mechanic for it; there’s a whole power system with switches and timers and so on that you could build into something fairly elaborate – that is, if you felt like dealing with the terrible building interface for several hours. 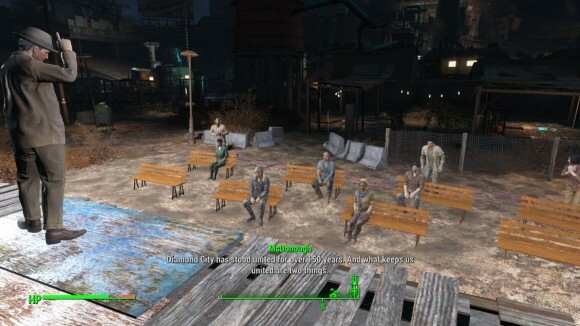 Now, I do kind of understand why the settlement construction is in the game. There’s a significant portion of the playerbase who buys into Bethesda RPGs as virtual worlds and will really get a kick out of being able to build their own mini-villages even if they’re ultimately pointless in a mechanical sense, so their inclusion makes a broad amount of sense. For me, though, the settlements needed to have some tangible effect beyond spawning half a dozen settlers into existence where there were none before. Maybe you start getting patrols of militia wandering around; maybe shops have a better selection of goods or better prices thanks to the increased security and civilizing effect you’re having on the wasteland; or maybe you could tie it into a questline that’s a little more elaborate than the procedurally generated “Go to location X, kill monster Y, come back” quests that you do to clear the settlement locations in the first place. There’s at least a couple of dozen ways I can think of to make this side of things more appealing to people who burned out on Minecraft several years ago, and it’s really puzzling that none of them are actually in the game. The rest of it is pretty much stock Bethesda, and if you’ve played Fallout 3 you’ll know what to expect. There’s one last minor plus point in that they actually managed factional endings to the game that branch somewhat in a mutually-exclusive fashion, similar to New Vegas, but this is cancelled out by the total dumbing down of conversation choices in Fallout 4 – apart from basic Charisma checks there are no dialogue-based skill/attribute checks anywhere in the game, and the actual dialogue has been condensed into a very bad implementation of the Mass Effect dialogue wheel where the one-word descriptions you’re given often bear little or no relation to what you character actually says. Oh, and your character actually says stuff this time; the player character is fully voiced, but the male voice actor’s delivery is on par with the notoriously awful hero dialogue from Ultima X. 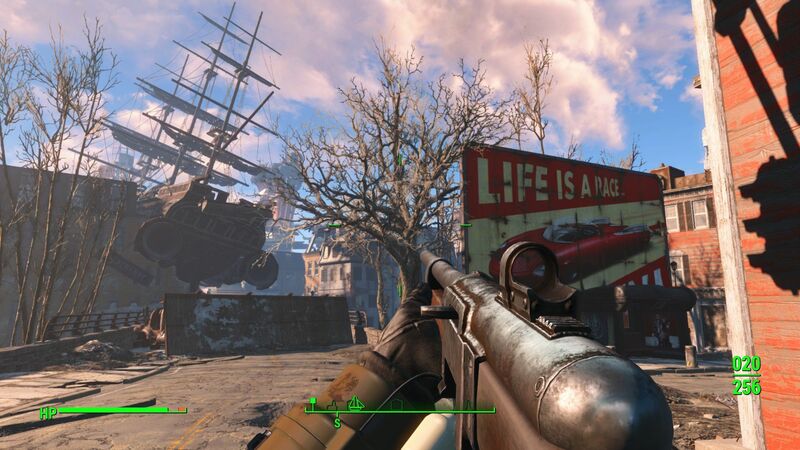 So, is Fallout 4 a good game? I’d tend towards a pretty solid yes on that count. I tend not to invest 36 hours of my time into bad ones. Will it change your mind on Bethesda games? No, probably not. If you have a fundamental problem with the way they put their RPGs together than Fallout 4 might not be the game for you; if on the other hand you liked – or are merely just ambivalent about — their previous efforts then it’s possible Fallout 4 might be a worthy sink for your time. That is, just so long as you’re capable of that goal-setting I talked about earlier. I played until I’d perfected my character build within the confines of the systems the game provided and then made a beeline to the end. Your criteria may be different, but as long as you can set them, and as long as they’re not plot-related, you’ll probably have a lot of fun with it. Ultimately I think it’s pretty telling that I’ve spent my time here almost exclusively talking about Fallout 4’s mechanics; I don’t think it’s a game to enjoy for its writing or its world, but there is enjoyment to be had here nevertheless. It’s clear you didn’t think too highly of the game’s writing, but I’d like to say that it’s a lot better than Fallout 3. I’ve encountered nothing as illogical as Little Lamplight or as pointlessly extreme as the Megaton decision. The Brotherhood of Steel actually seems in-line with their earlier depictions, and the companions are actually interesting and have a lot of character-specific dialogue. It’s not quite at New Vegas quality levels, but I think Bethesda deserve some praise for putting in the effort. Well it’s not a high standard, is it? Especially with Witcher 3 earlier this year. I may not like Witcher for empty world more reminiscent of Far Cry 3 than of a typical RPG, or limited ways of playstyles, or boring equipment system, or bonkers difficulty curve. All of this is better in Fallout 4 but the writing yet may win Witcher 3 GOTY instead of Fallout 4. Cause when I get some small sidequest in Witcher 3 it’s given me by believable character with his own understandable agenda and the problem may require non-obvious solutions leading to non-obvious results with some interesting twist or moral or just dialog. 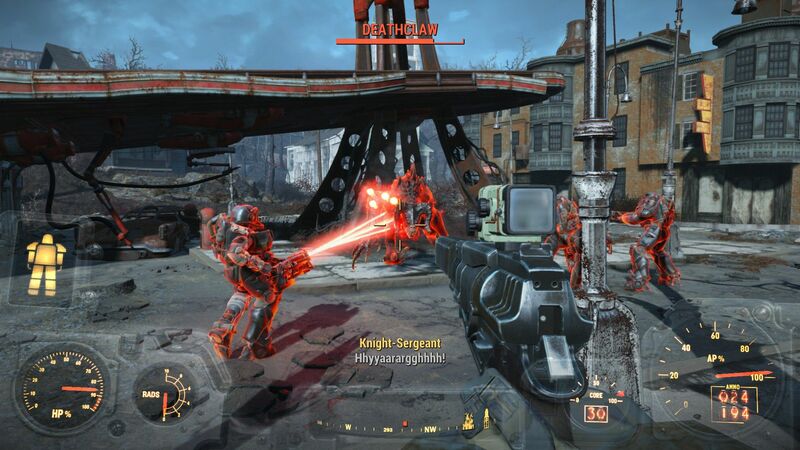 Compare it to Fallout 4 where after second Minutemen quest – and those are one of the first quests available to you! – I was thinking either about uninstalling the game or skipping all the sidequests in favor of just running through the main quest line. And in Witcher 3 I nearly put it down around Skellige because there was so much content and the story was going nowhere. I spent 10 hours helping out the Bloody Baron just for him to tell me that Cirri left for Novigrad, but it was obvious that Novigrad would be a good hiding place and was in fact on the list for Geralt to investigate. Then I go to Novigrad and spend another 10 hours or so looking for Dandelion, who tells me that Cirri vanished. Then I go to Skellige to spend more hours still to get enough information that, realistically, should be enough to forego at least one of the other two paths, but in actuality all three are necessary. The Witcher 3 is a pretty great game and largely well written, but it’s an exhausting game with a plot that feels far more padded than it needs to be, and unlike Fallout 4 the leveling system never really changes how you play the game, making it difficult to put in the enormous amount of time that is required. I’m not sure I’d call either one my game of the year,* honestly, but both are very good games with very real flaws on all fronts. *If you’re wondering, it’s probably a toss up between Bloodborne and Mario Maker. I will give Fallout 4 credit in that it had some much more interesting themes to play around with – I particularly enjoyed the Brotherhood of Steel being just as bad as the Institute, in their own way, and there was a fair bit of moral ambiguity in the game that I wasn’t expecting from Bethesda. It’s arguably their best written game so far, but when you stack it up against other RPGs in general I still think Fallout 4 at its best is comparatively average, and at its worst easily plumbs the same depths as Fallout 3. I don’t think I got the most out of the companions, mostly because of their penchant for jumping in front of my sniper rifle just as I pulled the trigger. I only really spent time with Valentine, and I will concede that he wasn’t half bad, as characters go. The latter half of the game I spent companionless, though. I’m not saying it’s amazing, just that Bethesda obviously put in some real effort to improve, which is more than you can say for many developers. My philosophy has always been that efforts to improve should be praised, particularly when they could’ve easily made a profit by doing nothing more than what they did with Fallout 3. I think I might have burned out on the proven Bethesda formula. Early this year I completed the Skyrim DLCs and struggled really hard not to quit. Prior to the DLCs I invested over a hundred hours into the vanilla experience and only for the last couple of hours I felt my excitement wearing off and me getting a bit annoyed by the mechanics. As soon as I started the DLCs I wanted to be done with them. The story didn’t engage me whatsoever, the mechanics were still shallow and boring and the NPCs are in general some of the most uninteresting paper cutouts in gaming. I did complete all the DLCs in the end, even though I didn’t enjoy them very much. In terms of Fallout 4 I was a bit hesitant because of my Skyrim experience a couple months back and started up Fallout 3 to see if it would grab me as Skyrim did when it came out. Ultimately I was disappointed as well. In addition to the horrendous problems this game has running on Win 7 it’s just as shallow if not worse than Skyrim is and only for short moments was able to excite me for what would be coming next. I realize that this is very likely a very personal issue I have with the game since a lot of my friends were shocked that I quit F3 after just a dozen hours while they enjoyed there time with the game immensely. But as I said in the beginning, this could be some form of Bethesda fatigue that I’m experiencing. I’m also a bit disappointed with F3 in comparison to F1 and 2 which I both liked very much and F3 was just missing something in terms of world and/or atmosphere which I can’t quite put my finger on. I will try New Vegas on some point because I heard it is supposed to be the better game (and I generally like Obsidian games) but before some time has passed. That said, Fallout 4 was initially something I was very much looking forward too, but since my experience with F3 and also reviews like yours and others which point out the overwhelming similarities with previous titles I’m taking a step backwards from purchasing the fourth installment and might come back to this in 2 or 3 years. Thanks by the way for your insights on this and all the other games you’ve reviewed on this site. You are doing a stellar job and I’m always looking forward to reading something new that you’ve put out. Keep it up! Thanks for the compliment! I find it hard to set aside enough time to play games these days, let alone write reviews about them, so it’s nice to know they’re appreciated. I keep meaning to go back to Fallout 1 and 2 to see how much I view them through rose-tinted glasses. My last playthrough was eight or nine years ago, and my overriding impression was that while the interface was clunky as hell you could cut the atmosphere with a knife. It’s not really a fair comparison to F3 and F4 because they’re very different styles of game despite being set in the same world. The thing with New Vegas is that it isn’t strictly a Fallout game – at least, not as the Fallout universe exists in most people’s heads. It’s got a very different feel to it and struck me as being somewhat less accessible as a consequence; it requires a bit of a mental run-up to parse what’s going on and why. However once you’re in the difference between it and Fallout 3 is like night and day. New Vegas is the reason my opinion of F3 has suffered so much over time, because it showed me what F3 *could* have been. So why are you then calling it a “Role-Playing Game”? Isn’t it more of an Action/Leveling/Crafting game with some role-playing features tacked on to “check all the boxes”? I’m not sure that focussing on labels helps anyone. The author is pretty clear what he means. So usually when I use the term RPG I’m using it in either (or both) its mechanical and thematic sense. In the mechanical sense, an RPG is a game where you play a character or a party of characters that fights monsters, gets experience, levels up, improves their stats and acquires loot in some sort of persistent world. Some of these elements have been bleeding through into just about every genre under the sun because developers have figured out they’re a great way to give a player the impression of long-term progression, but I think the mechanical identity of “an RPG” is quite distinct. 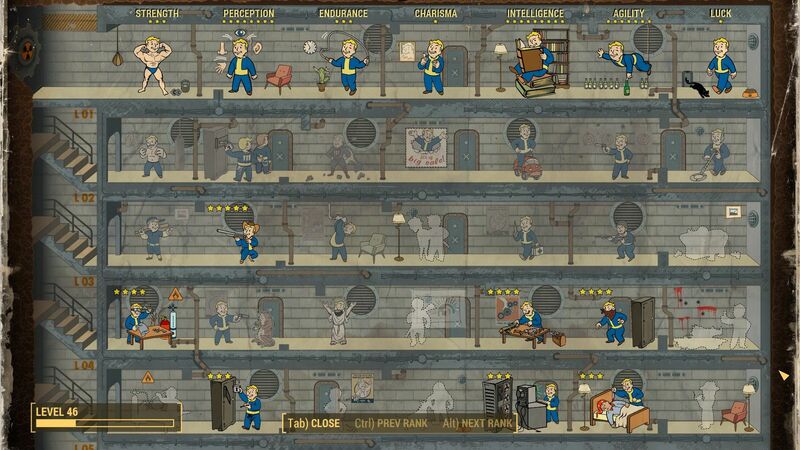 Fallout 4 easily qualifies, even if it doesn’t make the best use of all of these elements. In the thematic sense, an RPG is a game where you play to a role that you, the player, have chosen beforehand. This is where things get a bit muddier as it’s usually quite difficult for computer RPGs to cater to this demand – the player character can’t be given unrestricted freedom to choose their own path and they have to be railroaded somehow, so they usually plump for giving them a choice between a few different character archetypes or plot paths through the game. This is definitely one of Fallout 4′s weaknesses as you’re very much straitjacketed in how you can respond to specific situations, and the Karma stat is gone so there’s not even the illusion that your everyday choices might be having consequences of some sort. That being said you do get to make several decisions that alter how the plot unfolds so the story you experience is somewhat personalised. On the second criteria I would say Fallout 4 is borderline. I am probably not the best person to be arguing in favour of it as I didn’t think all that much of Fallout 4′s world; however I dare say you could find a lot of people who have wholly immersed themselves in it and would be fully prepared to do so. The thing is, though, I made pretty clear in the review that I was tackling the mechanical side of the game and why, as a collection of systems, I found it pretty compelling. I’m not going to get into an argument of whether having a set of RPG-like mechanical systems makes something an RPG or not; as I said above, the line is becoming increasingly blurred these days. For my money, though, it more than met *that* criteria. I’ve always thought of “an RPG” as a game in which character development is a game system and the choices you make within that system changes how you play the game. A game with a flexible story and no character development system–like a Telltale game–is not an RPG. A game with an entirely fixed story but robust character development–like Diablo II–is an RPG. 2. )the story those characters go trough. Finished the game. I think F4 commits two cardinal sins. First is giving us a protagonist who feels like a distinct voice-overed person in an open world environment. Reminds me of Gothic games: you do not yet played as a specific character like in BioWare games but you are not whoever you imagine like in previous Fallout/TES games. All Follaut games (except Tactics) gave you specific background but here I can’t imagine having a second playthrough with a different character. It would be the same guy but he’ll joke or ask for money more. I guess you express yourself through companions who form your morals and disposition but it doesn’t work well as good as in party games like Dragon Age. You just say whatever your single companion likes and that’s it. You are a pleaser. Second is more important. It’s crafting. In previous games it was fun to search the world to find interesting games. Even in TES 4 & 5 where loot was leveled. F4 is on one hand similar to Borderlands but even more so to something like Far Cry 3. You don’t find better loot, you find bear asses you transform into a better scope. Your first 10mm pistol is better than any other weapon you may find if you upgrade it to the max. Only Far Cry transformed the search for crafting materials in specific challenges like killing sharks. In F4 you find components by searching dumpsters. Ducktape and aluminium cans are the most important things in the game. Don’t go looking for cool places, just search some garbage. You can kill legendaries for legendary equipment – they spawn randomly so again there’s not much need to go into some special places looking for them. And legendary item bonuses are usually weak. And it’s all feels like some sort of MMO farming. Bethesda takes pride in a big world but doesn’t give you a reason to explore it properly. Except maybe boring predictable quests – each time you think there’s something interesting happening (like boosting radio DJ confidence, National Treasure quest) it all ends up with clearing a dungeon. It’s like deep inside Bethesda yearns for good old days of Daggerfall where all quests were created by soulless machine. Gunfight is fun, the game looks good but it’s probably a first Fallout game I wouldn’t play again. I’m not sure how to describe it, but after playing the Witcher 3 for a bit, everything else in the RPG (or RPG with guns, which is kind of what Fallout 4 is) feels rather inadequate. I guess it is the volume of content, depth, the ability to believe in the characters, and so on. In some ways, it doesn’t feel like the Bethesda team has really been advancing in this regard. I feel like they are just “playing it safe”, but the problem is that the game doesn’t have the sort of immersive experience that the Witcher 3 has. Skyrim I would argue was a bit too shallow on the exploration as well. So for this game to be worse in that regard makes it really a game that I would regard as a disappointment. 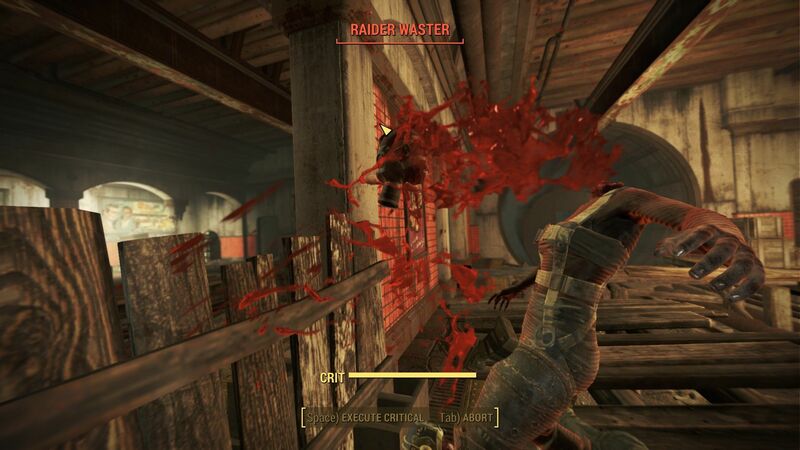 There are also a few bugs with Fallout 4 worth mentioning that may or may not hamper your experience.